I just... Wow. I don't even know how to describe how much I loved Josh and Hailey's story. I've been waiting for this one since the first time I was introduced to them in book 1, and Kylie Gilmore has NOT disappointed in her delivery of their Happy ending. We learn a lot more about why Hailey is the way she is, and also about Josh and what he thought of Hailey for all those years. God, it was fantastic. A sweet and funny read, and filled with tender romance. I can't wait for the next book!!! WOW was that worth waiting for! "It was about time!" I borrowed Mads words from the Inconvenient Plan by Kylie Gilmore. It is the 10th book in the Happy Endings Book Club Series and the build up to the Hailey and Josh relationship. Hailey and Josh love/hate relationship is tested when they become the best man and maid of honor for their parents. Hailey a wedding planner and Josh the manager of Gardner's where their parents want to hold the wedding reception. You will enjoy reading about the conflicts an the sexual tension between Hailey and Josh. 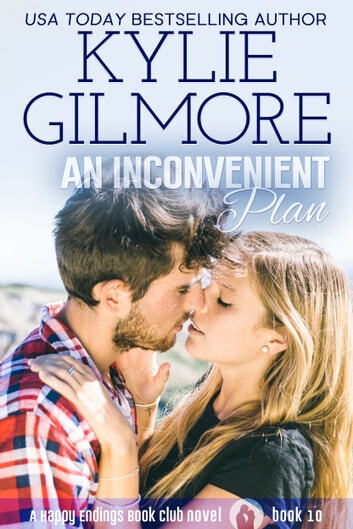 I highly recommend reading Inconvenient Plan by Kylie Gilmore and all the Happy Endings Book Club Series books you will love them. I received a free copy of this book and voluntarily chose to review it. I have been waiting for Hailey and Josh’s story since book 1! It did not disappoint, and was worth the wait. Some confusion, happiness, facing fears and a whole lot of passion! Yay for Hailey and Josh! Loved Hailey and Josh’s story! It’s a long time coming, and I’m glad they finally figured it out.